In 1991, Iraqi troops fleeing Kuwait opened the valves on the Sea Island oil rig in the Persian Gulf. They did it, allegedly, as a military tactic to block enemy ships from docking. No one could access the rig to plug the leak or research the impact for a while because of the military conflict. "Everybody was afraid to go there and study it," says the Harte Research Institute's Wes Tunnel. "Most of us scientists are not used to bullets when we're doing our studies." 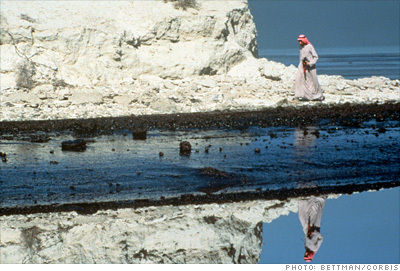 A survey taken after the spill estimated it would cost $540 million to clean the Saudi coast, which would have made it one of the more expensive spills to clean, but the government only allotted funds to high-priority areas. It's unclear how much they actually spent. It was the mother of all spills, but the Persian Gulf has warm, salty water without much wildlife, says Tunnell, so the environment may have been well-suited to absorb oil.